TVR is pleased to announce that after a successful launch at the Goodwood Revival last month, the new TVR Griffith will be on display at the NEC Classic Motor Show in Birmingham on 10-12th November 2017. Supported by the TVR Car Club, the latest bearer of the famous Griffith name will be on display on stand 450 in Prestige Hall 1, alongside examples of its namesake Griffiths from the 1960’s and 1990’s. After a fantastic launch at the Revival we’re looking forward to seeing the reaction of depositors and prospective customers who weren’t able to make the event at Goodwood. While the 500 Launch Edition cars are now all accounted for, orders for the Griffith Model Year 01 can now be placed – production will run straight into these after the first 500. 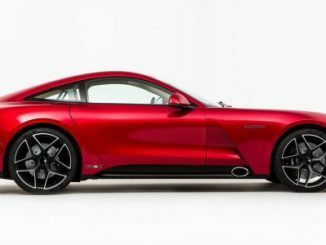 Employing a full ground-effect aerodynamic package to deliver outstanding stability and handling capabilities, the new TVR has been designed and engineered with driver-focused performance and safety as its main priority. Prospective customers are currently able to place a deposit on the new TVR Griffith MY01 at the TVR website. The all-new TVR features a 5.0 litre V8 powerplant with a custom clutch, flywheel, and ECU. In addition, a dry-sump and other enhancements by Cosworth together with a 6-Speed manual gearbox from Tremec are designed to deliver a class leading 400 bhp per tonne power-to-weight ratio. Gordon Murray Design‘s unique iStream process, in addition to being extremely lightweight, delivers exceptional torsional rigidity and passive safety capabilities. The vehicle’s carbon fiber composite construction boasts a rigidity of almost 20,000 Nm per degree and is also designed to direct impact forces to the tires for increased safety. The new car also features airbags, ABS and ESP.